With great pleasure, I was able to sit down with Mary and discuss the energy industry, its transformation and the critical role of communications. Watch an outtake here. And Part II of the interview below. Lauren Bell: What are the most important attributes of successful E.E. programs? Make it easy for customers to participate. Think about the Amazon business model - how can we make it as easy as possible for customers to do business with you? Personalize offerings and communications to make them targeted, relevant and meaningful to customers. They will participate if you do this right. Engage customers on feedback and prove to them it matters. Never assume you’re meeting their needs, unless they tell you that you are. Hold two-way, omni-channel conversations. Be there where customers need you. And respond. Every time. Engage employees. Provide them the systems, tools and training to provide a great customer experience. Train them with consultative communication skills in addition to technical knowledge. LB: In this market transformation, what role do you see communications playing in the E.E. conversation? MS: I am a huge believer that communication is the foundation to success in any conversation. As an industry, we need to continue to fine-tune our communications to consumers, trade allies and business customers. They need to be targeted, meaningful and relevant. We need to be in the right place at the right time, utilizing an omni-channel approach to engaging customers. From there, we need to provide actionable next steps making it easy for customers to participate in programs and initiatives. It’s also incredibly important that the customer have an opportunity to voice their questions, concerns and feedback, and to believe that it will actually make a difference. Think about Amazon and Uber. These companies have revolutionized the idea of customer feedback, allowing it to make or break products or drivers. Look at their successes. It’s a critical piece in formulating our plans and developing better communications with customers. LB: What role do you see "The Connected Home" playing in the E.E. conversation with utilities? MS: The Connected Home is the future norm for consumers in controlling their energy usage and the way in which they’ll run their homes. The future of all utility customers - Millennials - will expect nothing less than being able to control these things from their phone. Innovation and customer engagement will continue to build as this growing space brings traditional and non-traditional technology and energy providers, retailers and communicators together, developing new, unique partnerships and product offerings. I think the connected home will help the industry and consumers better manage the ever-increasing plug load technologies. The data that is being/will be collected with smart grid capabilities will continue to help our industry evolve communications and programs to help consumers with their energy usage. And utilities manage their loads. That being said, I’m not sure we can or should replace some of the attributes of traditional energy efficiency programs. Many homes and businesses will continue to need on-site delivery mechanisms to address HVAC, building envelope and systems upgrades. Energy efficiency funding entities have positively benefited from having a human being in the home interacting in a positive way with home and business owners. Although there can be some exceptions, in my experience, the satisfaction for the utility increases when there is an in-home/business interaction. LB: After 25 years in energy efficiency, what made you want to join an advertising agency? MS: I began my career on the utility side, developing marketing and communications plans for the first generation of E.E. programs. Over the course of 25+ years, both on the utility and service provider side, I have had the great opportunity to develop teams and initiatives across various points of the customer journey in these programs. The opportunity to join an advertising agency is exciting to me, allowing me to leverage my years of E.E. experience and partnerships. My goal is to continue to positively impact program results and the customer experience and mindset through these communications initiatives. Before joining KSV last month, Mary served as executive vice president of Conservation Services Group (CSG) in Westborough, Mass., where she led client services and customer engagement teams, and directed key account management activities, business development, corporate marketing and internal communications. CLEAResult acquired CSG last year and Mary served as vice president of customer experience until earlier this year. Prior to CSG and CLEAResult, Ms. Stewart held leadership positions at NORESCO, EUA Cogenex, Eastern Utilities Associates and Green Mountain Power. KSV, a Certified B Corporation, is a marketing firm with offices in New York, Vermont and Rhode Island. 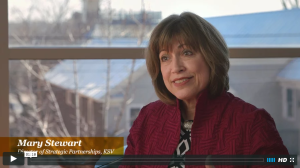 For more than 30 years, KSV has partnered with clients whose missions help drive an effective and more sustainable future. The firm’s marketing expertise is primarily focused today on energy, energy efficiency and the connected home.